Don't let the cuteness fool you! Doctor Life is a challenging casual simulation game! Don't let the cuteness fool you! 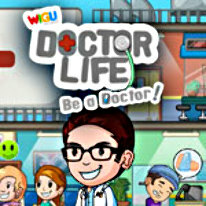 Doctor Life is a challenging casual simulation game where you take on the role of a Doctor! Set in a charming little city with wacky patients, you must grow your humble clinic into a multi-story hospital! You will meet patients along your journey and help them by diagnosing and treating their real life diseases with actual treatments. Beware though! There is an evil tycoon out to buy the land your hospital is on. Earn awards for hospital excellence to save your hospital from his grubby hands.